South of the river, the atmosphere is relaxed and bohemian. You're never far from quirky eateries, fascinating art galleries and concert halls, and have access to high speed transport to any part of the capital. The Southbank is establishing itself has a highly desirable residential location. The Southbank is located on the south bank of the River Thames. It stretches two square miles and forms a long and narrow section of riverside development within the London Borough of Lambeth and the London Borough of Southwark. The area is hemmed in between the river to the north and the viaducts of the approaches to Waterloo, Charing Cross, Cannon Street and London Bridge railway stations to the south. The Southbank developed much more slowly than the north bank of the river due to a shallower channel in the river Thames. 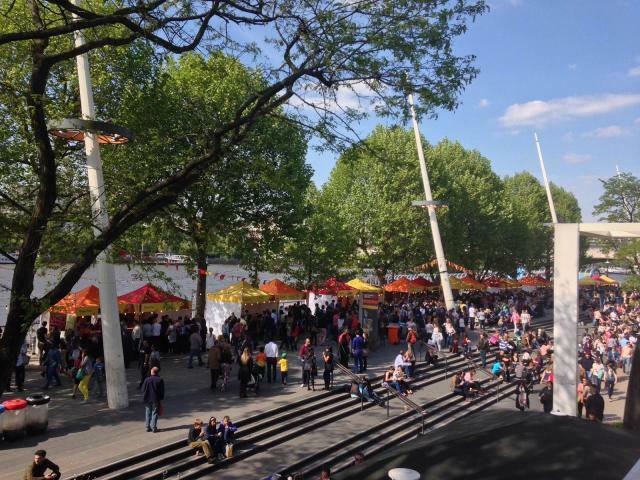 However, the Southbank has always been a place of entertainment. In the middle ages it was famous for its theatres, prostitution and bear-baiting; however by the 18th century a slightly more sophisticated style of entertainment had emerged. Following the end of the Second World War the country needed something to reinstall their faith in the nation and so the Festival of Britain was born and Southbank played host. The Royal Festival Hall was built to hold it and was soon joined by the National Theatre, the National Film Theatre, ITV London and many others. This has helped Southbank develop its well-known image as a centre for the arts and media. Southbank now forms a significant tourist district in central London, stretching from the Design Museum in the east to the London Eye in the west. A series of bridges connect the area to the northern bank of the Thames, including the more recent Golden Jubilee and Millennium pedestrian bridges. The area also provides incredible views of landmark buildings north of the river. The Southbank is now recognised as the cultural heart of the capital and a popular arts and entertainment district. The Southbank Centre comprises the Royal Festival Hall, the Queen Elizabeth Hall and The Hayward. The Royal National Theatre and BFI Southbank are located adjacent to the east. The County Hall is no longer used as the seat of London Government and has been converted to the Sea Life London Aquarium and the London Marriott Hotel County Hall next to the London Eye. The OXO Tower wharf is situated towards the eastern end of Southbank and houses galleries, shops and boutiques as well as the world renowned OXO Tower Restaurant, run by Harvey Nichols. Part of the success of the area as a visitor attraction is attributed to the high levels of public transport access. Several major railway terminals are within walking distance of the Southbank. The river is also a great means of transport with piers along the Southbank at the London Eye, Royal Festival Hall, Bankside and London Bridge.